Throw pillows are usually the final touch on your living room decor or your bedroom decor. They’re a fun and easy way to add some character to the room you’ve carefully designed and decorated. Often times, throw pillows are a great way to tie everything together about your space, like the theme and color palette. With seemingly endless options for throw pillows, it’s hard to know how to choose the right throw pillow for your space. 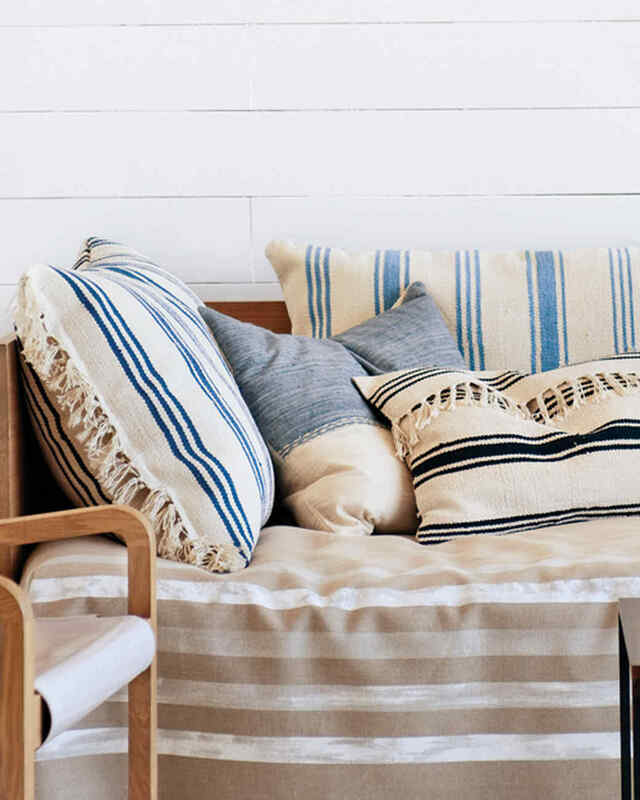 Here are a few guidelines for choosing throw pillows! Color is probably the most obvious consideration when selecting throw pillows for your space. 9 times out of 10, you’ll want to select a different color throw pillow than the fabric of the surface it will be laid upon. 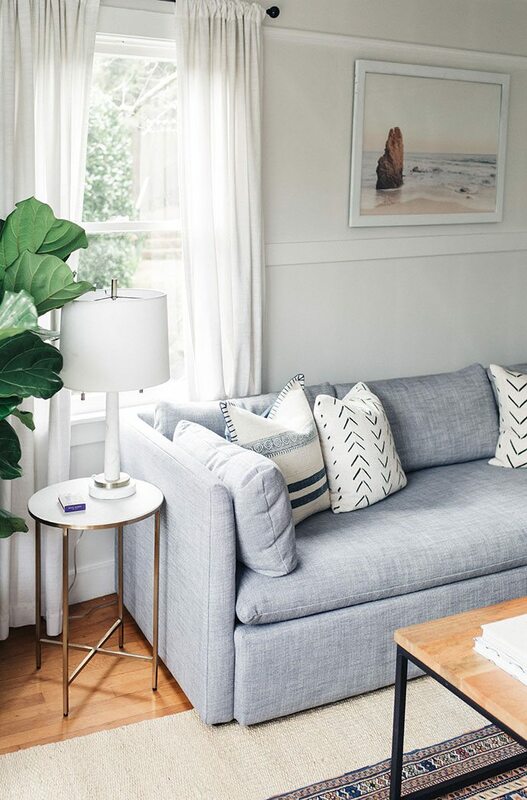 Unless you’re intentionally going for a monochrome look, a throw pillow should be a considerably different shade than the sofa or bed it’s on. Lots of pillows are multi-colored. Generally speaking, if you have a solid colored couch, then you can feel free to play around with multi-colored and patterned throw pillows. 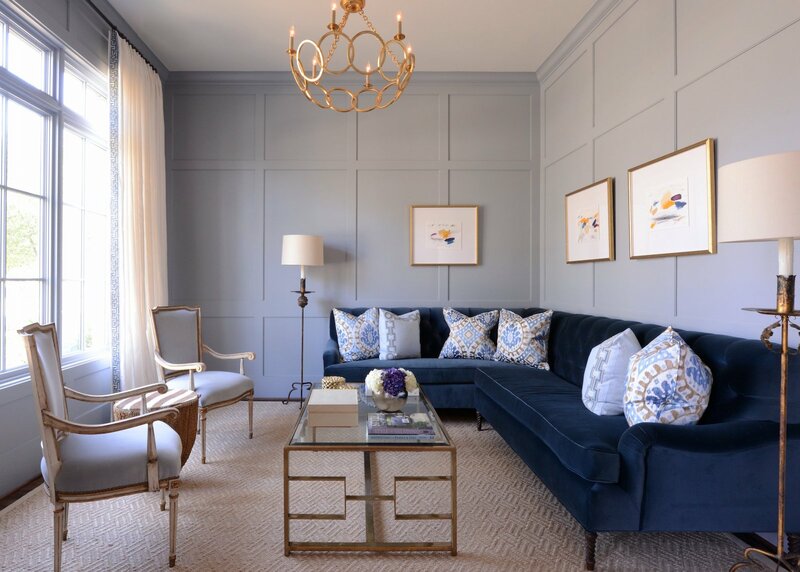 If you have a patterned sofa, then you should likely stick to solid-colored throw pillows and stay away from intricately patterned throw pillows that will make your space look too busy. Square: The most versatile option with the most choice of covers available is the square throw pillow. Lumbar: Lumbar pillows are rectangular in shape. They are great for lower back support. Round: Round throw pillows are a fun option that will give your sofa a less boxy feel and a slightly feminine touch. Bolster: Bolster throw pillows are typically found on either end of the sofa, next to the arm rests. Standard Square Throw Pillows – 18-20 inches: These typically work best on standard long sofas and twin or full sized beds. Small Throw Pillows – 16 inches: Smaller pillows are great on sofas with low backs. They’re also good for placing on accent chairs. Oversized Throw Pillows – 24+ inches: These pillows are great for lounging on your queen or king sized bed or large sofa. As you can see, throw pillows should be proportionate to the furniture they’re placed on. The smaller the pillow, the smaller the piece of furniture. Don’t be afraid to experiment with different fabrics, materials, and texture. Velvet and linen are some of our favorite throw pillow fabrics. You can also play around with a textured pattern throw pillow to add dimension to a space. Texture and fabric especially comes into play if you are decorating a monochromatic interior. Changing things up in terms of fabric can really make all the difference in a one-colored space. Many throw pillows will feature extra decorative accents like fringe, trim, or buttons. Be careful with choosing a throw pillow with too many embellishments as they can easily make your space look too busy, or draw attention away from the intended focal point of the room. Throw pillows with trims like tassels and pom poms typically work best in bohemian interiors, but not really anywhere else. Once you have an idea of the color, shape, size and texture of the throw pillows you need for your home, then it’s time to buy the inserts. Part of what makes throw pillows so awesome is the ability to change the look of them so easily. Buying several good quality inserts that will last many years allows you to modify your living room or bedroom with ease as your style changes over the years. Throw pillow inserts can be made of natural or synthetic fibers. Down feather pillow inserts are plush and comfortable, but many people are allergic to them which could cause problems for any guests. They also tend to lose their shape over time, which isn’t ideal. Synthetic fillers are easier to maintain but are typically firmer. Because of this dilemma, many people opt for a synthetic/down feather mix. Alternatively, you could use a synthetic polyester fill insert for a purely decorative pillow, and a down feather insert for the pillows you actually want to use to be comfortable. We recommend these budget throw pillow inserts (only $8! ), these highly rated hypoallergenic pillow inserts, and finally these high quality down/feather pillow inserts. There are many ways to style decorative throw pillows in your home. When it comes to arranging throw pillows on your sofa, a general rule of thumb is that 2-3 pillows of varying sizes per corner of your sofa will suffice. So, if you have a standard sofa, you should plan for two groups of pillows in each corner. That would include sofas with chaises, too. If you have an L-Shaped sectional with three corners, then you should plan for 3 groups of throw pillows. Side chairs should have 1 throw pillow only. In any pillow arrangement, only 1 pillow should have a pattern or print on it. The other 1-2 pillows should be mostly solid colored (textured is fine), that ideally complement the patterned pillow. Beds should have 2-3 pillows, at most. The ideal configuration 2 identical pillows on the larger side, and 1 accent pillow on the smaller side. The two large pillows would sit next to each other, front and center, while the smaller pillow would sit in front of them, centered. I hope this throw pillow guide helped you choose throw pillows for your space! Show us how it looks by tagging us on Instagram @curatedinterior.